Ariel Massengale played college basketball at the University of Tennessee in Knoxville, Tennessee for the Lady Volunteers. In the 2015 WNBA Draft, the Atlanta Dream selected Massengale in the third round as the twenty ninth pick overall. 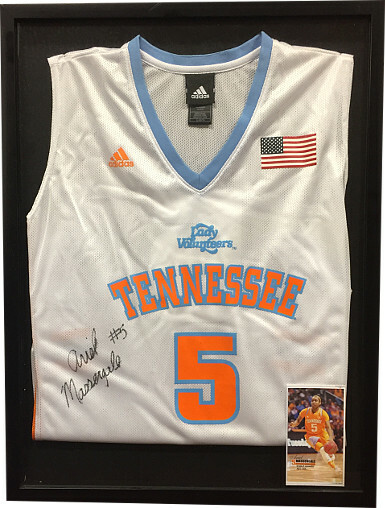 Ariel Massengale signed Tennessee Volunteers Adidas White Rep Jersey #5. Custom Framed to overall size of 19x25 w/ Photo. Certificate of Authenticity from Athlon Sports Collectibles.